A study is described which examines the drawing accuracy of experts when drawing foreshortened projections of 3D curves in ecologically-valid conditions. The main result of this study is that the distribution of error in expert drawings exhibits a bias similar to that previously observed in non-expert subjects, which is dependent on the degree of foreshortening of the imagined drawing surface. A review of existing perceptual studies also finds that only absolute 2D image-space error has been considered, which has been found to be largest with viewing angles of 25-55°. Our visualizations of 3D error indicate that 3D bias continues to increase with decreasing viewing angle. 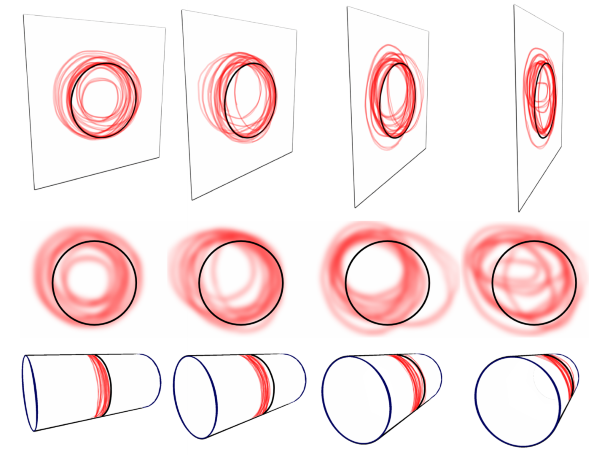 Based on these findings, we analyze current 3D curve drawing techniques for susceptibility to foreshortening bias, and make suggestions for future sketch-based modeling systems.